Here is my painting, in gouache on paper, that I completed today. It measures 7 x 5 inches. My intention, as I began working on this painting, was to create a painting of interesting clouds. And afterwards I spent a considerable amount of time working on the tree. 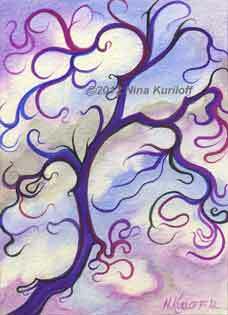 After I painted the tree, I worked on the clouds much more and on limbs of the tree, as well.